Heat 2 Tbsp oil in a large pot over medium heat. Sauté the onion, garlic, celery and carrots 2-3 minutes. Add turkey and cook until just browned. Add spices, tomatoes and pumpkin purée. Cover and let simmer on low heat for 30 min. While sauce is cooking, make “zoodles” by spiralizing zucchini and sauté in remaining 2 Tbsp oil for about 5 minutes. Zucchini should be just tender. 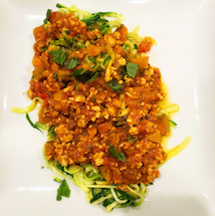 Serve sauce over “zoodles” and enjoy!